British Chess Company Library Size Staunton Chessmen. 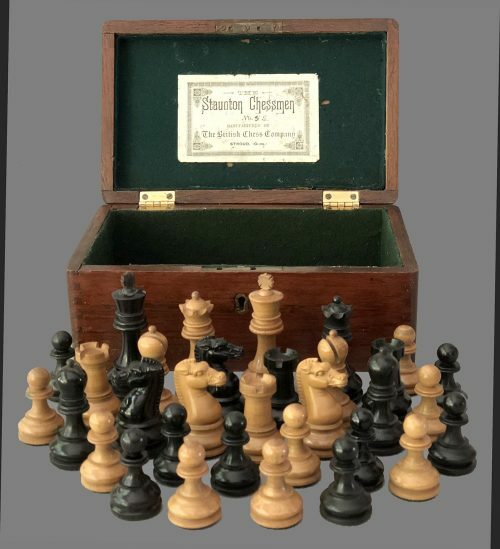 A set of British Chess Company Library Size Staunton Chessmen, weighted, with green baize base pads. These vintage chessmen are crafted from Boxwood and Ebony. The King stands 3-0″ tall with a 1.3″ diameter base. All the chessmen still have their original green baize base pads. These style chessmen are characterized by the Xylonite Knight heads and the double collars not found on the Popular Staunton chessmen. This feature was carried over to the the Patented Royal design and the Imperial Chessmen. The King’s finial is a modified Maltese cross. 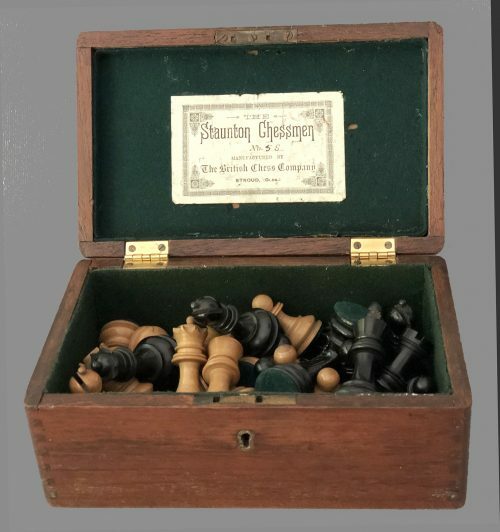 The British Chess Company Improved Staunton Chessmen are housed in their original Mahogany hinge-top box with the white British Chess Company label and the size, “No. 5”. 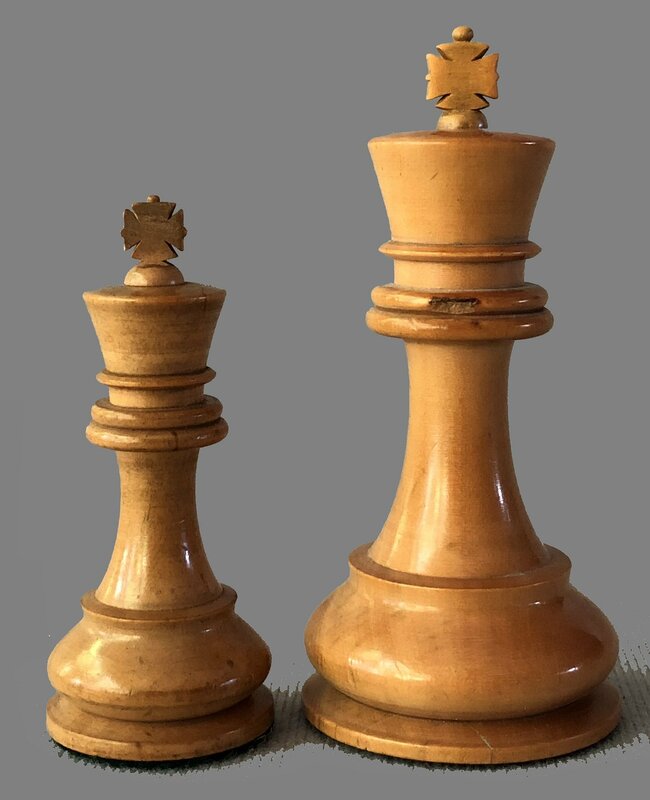 A comparison of the British Chess Company Library Size Staunton Chessmen with the Small Club-size set is shown in the accompanying galley. 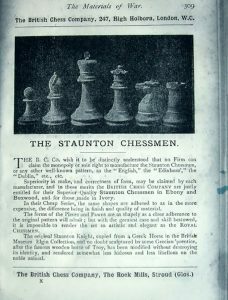 The British Chess Company Improved Staunton Chessmen were produced around 1895. The chessmen are in excellent condition for their age and have developed a very pleasing honey patina. These chessmen were sold under The British Chess Company name. These chess pieces play and display best on a chessboard with 1-7/8″ or 2-0″ squares. A suitable chessboard can be purchased elsewhere on this site. To see our current selection of new and antique chessboards, click here. An extensive inventory of antique and contemporary chess timers can be found here. manufacturing chess pieces in 1891 until their apparent demise in around 1907 or so. The BCC attempted to compete for the chess set market against the established firm of Jaques of London. 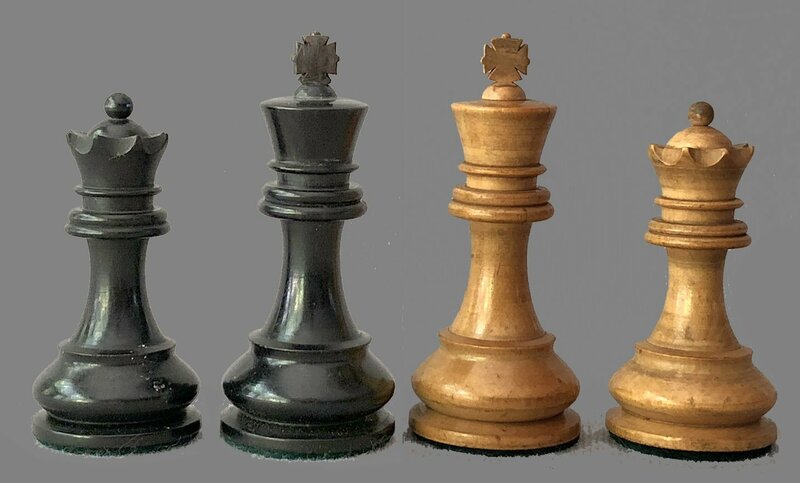 Their unique contribution to the design of Staunton chessmen, aside from their innovative, patented Imperial and Royal chessmen, was their use of Xylonite. Invented in 1869, Xylonite is a Celluloid, a class of compounds created from nitrocellulose and camphor. (Xylonite is generally considered the first thermoplastic.) 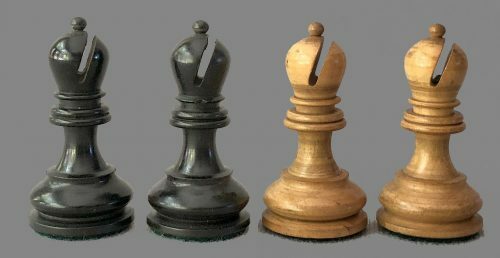 Moffatt devised a method of reducing the cost or producing chessmen by molding the Knight heads from Xylonite. 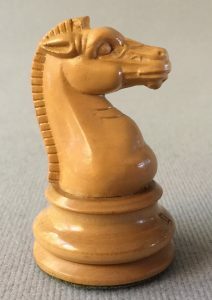 Carving the Knight heads can represent almost 50% of the total cost of producing a set of quality chessmen. In this manner, BCC was able to manufacture a set of high quality chessmen at half the cost of its competitors. It is sometimes claimed that BCC stopped producing their own chessmen around 1903, with other chess activities continuing for a few more years. However, that claim has not been substantiated and there is ample evidence that shows their still offering chessmen as late as 1907. Additional information on the British Chess Company can be found in the following article.